You know when you just really crave cake? That first bite into a pillow-soft sponge? I get that cake craving at least once a week. If I gave in to all those cravings, my diet would be in a bad way, which is why I have adopted the doctrine of “Be Kind To Yourself”. Here, I let myself indulge in gorgeous sponges – just a few small bites and I’m sated. Here is my recipe for a super quick sponge. As the cakes themselves are fairly small, I needed smaller tins. 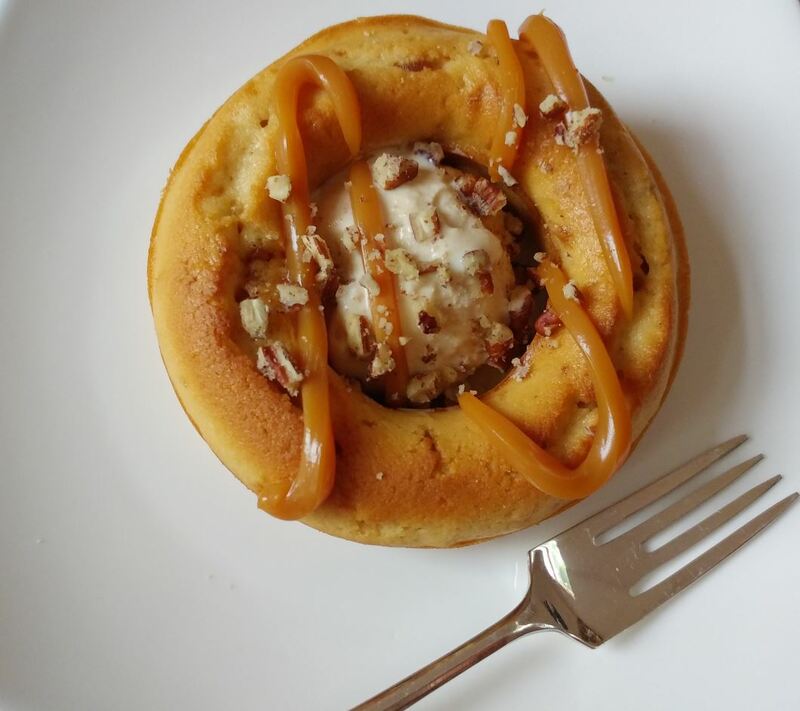 I used Silverwood Bakeware’s baby savarin rum baba tins for this recipe, which are super easy to use and a joy to look at. I will be making rum babas soon, so do keep your eyes peeled for that (I’m just waiting for my special rum to arrive). The beauty of these quick mini sponges is that they are really versatile and highly customisable, so you can add whatever you like in the middle hole (perhaps a small pile of popcorn)? Or perhaps a mini mound of chocolate? It is entirely up to you. I used toffee apple flavour as it’s officially autumn, and with Halloween around the corner, these bakes are really easy to customise with your Halloween inspired decorations. If you like, substitute the toffee apple icing sugar for vanilla, then decorate with more avant garde flavours if you dare. What flavours have you experimented with, or would you like to bake with? I keep seeing chocolate in savoury dishes, and although I’m not sold on this flavour (come on, chocolate in a savoury dish? ), I’m willing to give it a try. Again, keep your eyes peeled for this new savoury chocolate incarnation. Preheat oven 160° fan and grease tins. Throw all ingredients into the KitchenAid with the paddle attachment and beat for around two minutes. If not using a food mixer, beat by hand for a few minutes with a wooden spoon (and get a mini-workout in too). Mixture should be a thick dropping consistency. Get a tablespoon and scoop the mixture into the tins as evenly as possible. Bake for around 12-15 minutes, or until golden brown. Toast the pecans for a few minutes in a saucepan. Bash and whilst still hot, sprinkle over a little of the toffee apple icing sugar. Serve with salted caramel ice-cream. Other ice-cream flavours work too; choose vanilla if you prefer more muted flavours, or butterscotch ice-cream to add another layer of “toffiness” to this quick and easy dessert. I love toasted flavours, and to accentuate this flavour, I drizzled over toasted caramel popcorn sauce. It looks visually very inviting too, don’t you think? 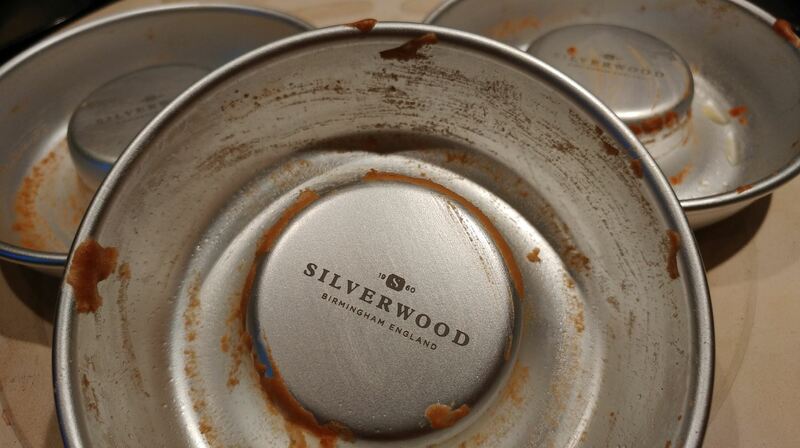 Thank you Silverwood for gifting me these three pretty and versatile mini savarin moulds.